Video slideshows are another way of presenting information to your audience. For our class, it is a good medium to combine various multimedia elements. In class we'll talk about the difference between these two mediums and when they should each be used. Animoto is a Web application used to create video slideshows. In class we'll set up accounts and look at some features and tools. Create a video slideshow using this rubric - UPDATE. 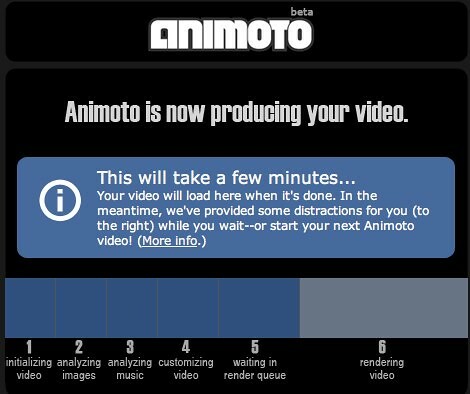 Animoto is a cool application, but we can't control all aspects of our video. Windows Movie Maker (free) is another video slideshow program that gives us a number of tools and options to tweak our final videos. The above videos give a good overview of the program and also demonstrate how it can be used to create a trip video/movie. In class we mentioned that video slideshows can be a creative way to showcase your personal photos (trip, senior video, wedding, anniversary, memorial, etc.). - When creating a video slideshow, make sure to put all your pictures, video files, music, and everything else into the same folder. - When you are still working on a project, you want to save the project. When you're all done, you need to save or publish the movie. - There should be a clear theme in your video. I should be able to watch it and know it's about ______. Also, make sure your music matches your theme and pictures. - On the bottom of this page I've included some pictures and directions for Movie Maker. - We only have a few scanners in class. I recommend using your camera or one of the apps below if you need to scan pictures. Complete the Trip or Senior Video Project using this rubric.